What's the Better Hike - The Kerry Way or The Dingle Way? What’s the Better Hike – The Kerry Way or The Dingle Way? Last year I walked the Kerry Way and the Dingle Way, two long distance walks in western Ireland, back to back. So what’s the better hike? Is one necessarily better than the other? What’s to compare? The Kerry Way is the more famous walk of the two. It starts in Killarney and wanders through a variety of terrain for 203 kms (122 miles). It is primarily an inland route. Most people allow 8-10 days and the 10 day venture would allow the chance to visit the Skellig Islands – a must do side trip in my opinion. Highlights on the Kerry Way include the following. 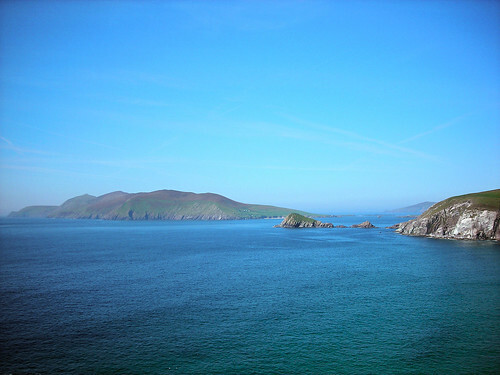 The Dingle Way combines some of Ireland’s best scenery with a rich archaeological history. Look for peaceful countryside with wild ocean vistas, cliff tops and beautiful countryside on a 179 km (112 mile) walk. Almost half this walk is on tarmac! The only serious elevation gain is on the day when you need to get up and over Brandon Mountain. This walk is best done over 7-8 days; mileages range from 17 kms to 29 kms per day. Both walks are well sign posted and both have sections with bus service so you can skip a section if need be. Now that I’ve listed the highlights I think I would take the Dingle Way over the Kerry Way because of the proximity to the sea. But I would still want to head to the Skellig Islands and hike through Killarney Park. Detailed guides for both the Kerry Way and the Dingle Way are available as a free download from my website. You’ll find a list of tour companies – some of which are very reasonably priced – if you don’t want to try the walks on your own. I can guarantee sore feet and tired shoulders but also a fine sense of accomplishment. Both walks are worth doing and in the end it’s hard to pick one over another. A very substantial thank you for the information. I’m hoping to hike one or the other, although I’d love to hike both. Thanks again. @Gordon You’re very welcome. Good luck with whatever one you choose. Great article and very helpful, as we were deliberating which to do coming the end of this September. Think we’ve decided on the Dingle Way. You’ve got a great site! @Tzippi It’s a tough call but I don’t think you’ll be disappointed. I like the fact that there is quite a bit of seaside walking along the Dingle Way and less so on the Kerry Way. I`m planning a hiking trip with my friends in Dingle in the beginning of August. We just have 6 full days and we are planning to take our tents with us to reduce the costs. Are they ok with wild camping in Dingle if we clean up everything behind us? Thank you so much!! @Maren I don’t remember what the rules are with regards to wild camping. I’d check out the Ireland Tourism office for their help on the matter.